Parish Boundary Change - Properties on the northern side of Cambridge Road A603 ("New Wimpole") were in the Parish of Wimpole. Properties on the southern side of Cambridge Road A603 ("New Orwell") were within the Parish of Orwell. In 1999 South Cambridgeshire District Council and the two parish councils agreed a southwards relocation of the parish boundary so that the properties in "New Orwell" became part of the modern Parish of Wimpole. 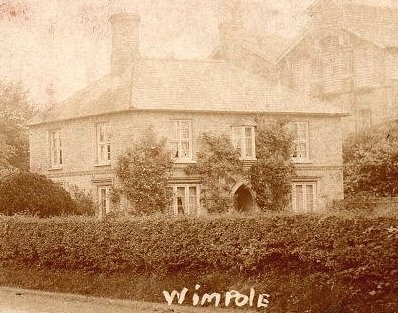 Following a poll of residents, the village (now both sides of the Cambridge Road) was officially renamed the village of "Wimpole" on the 1st April 1999. A further four Orwell properties located on the northern side of Cambridge Road A603 (No 20, Wilshers Garage, and nos 18 and 16), were also transferred into Wimpole in 1999, but they were built after 1901 and so do not appear here. (2004) My thanks and acknowledgments to the original 'census team' who provided the documentation and who typed and checked the various page transcripts. Particular thanks to Mike Giddings, Susan Giddings, Alexandra Morton and John Parkins for all their help, assistance and encouragement. This presentation of a typed transcription is by Steve Odell. The seven cottages on the right were built c1876 for workers employed at the new Meyer's brewery. The three cottages on the left have been traced back to at least the 1840s, pre-dating the brewery complex. can be glimpsed over the cottage rooftops on the left. [At the very end of the original 1901 Census document covering Cambridge Road/New Orwell, there is a crossed-out entry that simply reads "Cambridge Road, Newell & Sons, Blacksmith's Shop". 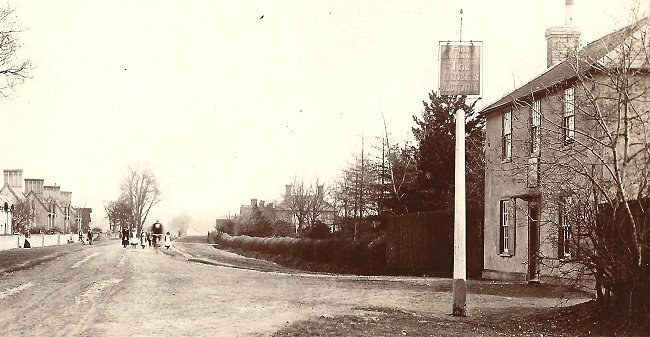 My understanding is that their blacksmith's shop was the first building on the south side of Cambridge Road when entering Wimpole from the Cambridge direction (above left). I have therefore relocated the crossed-out record to this location until someone tells me otherwise. No residents were recorded. See two other related photographs here. The building in 1901 was mainly of timber construction as seen above, the modern building, on approximately the same footprint, is all-brick. The building later became a cycle and motorcycle sales repair shop and later still, a roadside cafe. It is now a private residence. (1) Following a parish boundary change in 1999, this "New Orwell" property is now located within the Parish of Wimpole. (1) William Stacey Reed married Sarah Ann Spacksman at Wimpole Parish Church on 28 October 1899. (2) Following a parish boundary change in 1999, this "New Orwell" property is now located within the Parish of Wimpole. (1) These seven cottages were built c1876, originally to house workers at Philip and Arthur H Meyer's Orwell Brewery. See also the Old Brewery Building. (1) Robert Henry Rayner married Martha Law at Arrington on 12 November 1873. (2) For some years this property was the Wimpole village shop run by Mrs Rayner. Look at the centre of the image above, and you can identify the shop by the small name board over the ground floor window. (3) These seven cottages were built c1876, originally to house workers at Philip and Arthur H Meyer's Orwell Brewery. See also the Old Brewery Building. (1) Arthur Edward Taylor married Sarah Jane Payne at Arrington on the 26 December 1898. (2) These seven cottages were built c1876, originally to house workers at Philip and Arthur H Meyer's Orwell Brewery. See also the Old Brewery Building. (1) David Bullen, 30, labourer, married Mary Ann Clarke, in Wimpole Parish Church on 29 April 1897. (2) John Bullen, baptised at Wimpole on 5 May 1899. (3) David died 14 May 1936, aged 69, Mary died 29 April 1939, also aged 69, both at Arrington Almshouses. 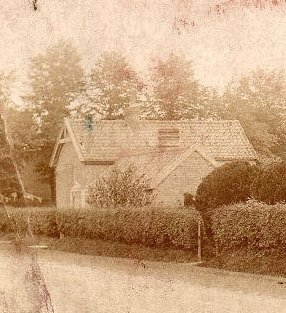 (4) These seven cottages were built c1876, originally to house workers at Philip and Arthur H Meyer's Orwell Brewery. See also the Old Brewery Building. (1) Edward Wilkins married Rebecca Smith at Arrington on 13 October 1857. (1) Charles John Clarke Rule, baptised at Wimpole 12 October 1862. Mother Emily (Emma) Rule. No father listed. Note 'Clarke' in given name. Emily (Emma) Rule married Samuel Clark(e) a year later at Wimpole (14 October 1863). See also Wimpole Census (Part Two) Schedule 32. (2) Charles John Rule (assumed son of Samuel Clarke) married Mary Ann Goats at Wimpole on 3rd May 1888. 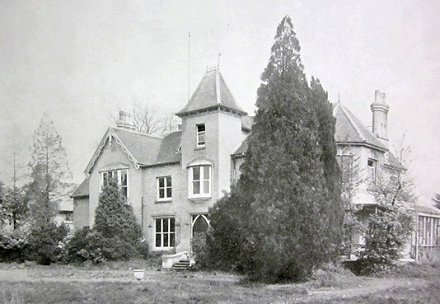 Two photographs of "Oatlands" (renamed "Orwell Grange" from c1908). 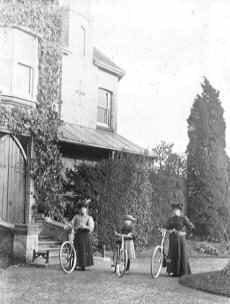 On the left are some cycling ladies photographed outside the front door c1905. On the right is a rather unkept [and unoccupied) Orwell Grange at the time of the second post-WW1 sale in 1922. (1) Philip (1829-?) and Arthur Hugh Meyer (1835-1909) were brothers, born in Arrington to parents James Hugh Meyer and Hannah Haydon. (2) Oatlands was built c1876 by brothers Philip and Arthur, situated behind their Orwell Brewery. (3) David Miller has a page on the Orwell Brewery and some of the history of 'Oatlands' on Orwell Past and Present. (4) See also The Old Brewery Building page on this site. Unoccupied on date of Census. (1) Not scheduled or detailed on the Census documentation. Just a blank line and a tick in the unoccupied column. (2) This house was built c1876, originally to house the Works Foreman at Philip and Arthur H Meyer's Orwell Brewery. (2) This house was built c1876, originally to house the Works Manager at Philip and Arthur H Meyer's 'Orwell Brewery'. 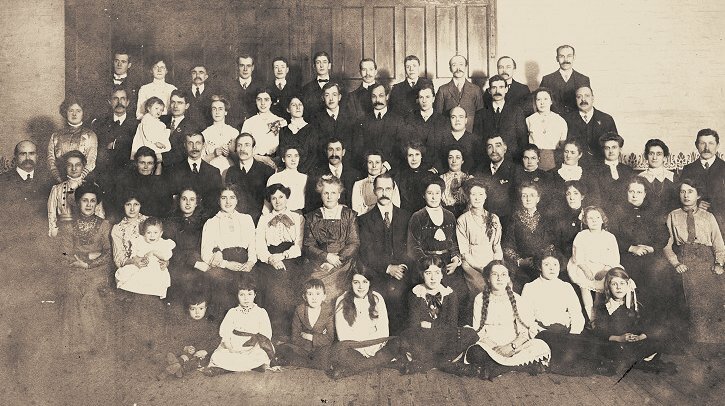 and photographed around 1905. The inn sign says 'Fine Royston Ales'. The Estate Cottages are on the left of Cambridge Road. The 'Manager's House' is on the right (centre image). James WALKER Lodger S 13 - Guilden Morden, Cambs. (1) William George Newell died 19 March 1967, aged 91, is buried in Wimpole Churchyard together with wife Katherine Elizabeth Newell, who died 1 September 1959, aged 73. (1) I don't know the date the pub was demolished but the 'Orwell Past and Present' website says "The Queen Victoria" was still serving customers into the 1950s. It was replaced at some point by the Majestic Motors Garage. (2) Following a parish boundary change in 1999, the site is now located within the Parish of Wimpole. (1) Arthur William Turrell, born 1873, was the son of William and Ellen Turrell of Croydon, Cambridgeshire. (2) Arthur William Turrell and Elizabeth Ann Young married at Boston, Lincolnshire in 1897. (3) Arthur William Turrell died aged 82 in Cambridge in 1952. (4) The "Fox and Hounds" is now a private residence. The 1901 Census for "New Orwell" ends here.